Your customers may not have planned to buy ponchos or rain protection gear during their vacation, but that doesn’t mean they won’t need them. 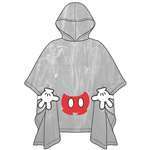 At Jerry Leigh, we carry both adult and kids’ ponchos to ensure vacation fun doesn’t become a wash. Plus, our ponchos come in a variety of colors and feature Disney favorites like Tinker Bell and Mickey Mouse, as well as Nickelodeon characters like Spongebob Squarepants. To find products that will protect your customers from unexpected rain and bad weather, browse our full selection of wholesale ponchos above.